Have you ever noticed in most movies, TV shows, and more so, on TV commercials, that you can almost immediately discern that whomever is supposedly playing tennis may have had their closest and only encounter with the sport back when playing Pong on an Atari machine some time back in the '70s. It's comical. Well, a few months ago I was browsing the TCM (Ted Turner's Commercial-Free Classic Movie Channel) schedule on my box hoping to find something interesting or entertaining to waste a couple hours with, perhaps Bogey up to something mysterious, Gary Grant being witty in most anything he did or Lauren Bacall just being Lauren Bacall. I love classic movies and am no celebrity hound by any means. I'm just throwing around some names. Instead I take note of this flick starring Spencer Tracy and Katharine Hepburn, Pat and Mike - 1952. Okay, here are two actors you couldn't go wrong with back in the day, but will this work. Do I even care, or did I just want to get my mind away from wherever it was at the time? Spencer Tracy, Mike, plays a shady (relative to the times) sports promoter and Katharine Hepburn, Pat, is an athlete with a good chance at reaching the golf and tennis championships. Well, they have this scene whereas Hepburn is playing a tennis match and for the first time, finally, going back over 50 years, I see an actor in a movie playing tennis who actually knows how to play tennis - peas and carrots. Unless one believes tennis has always been played as it is today, one should still be able to recognize an experienced player, even one from 1952. She was. 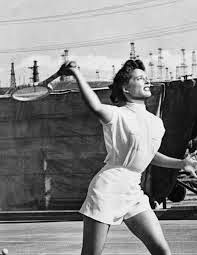 Hepburn's parents instilled athleticism in their children as well as being very active in any pursuit or cause they held dear - not such bad guidance. Here is a photo from her playing the match in the movie. Hepburn also continued to play the game well into her later years. RIP. I tried to find some related tennis video from the movie (trying with TCM), but all I found was the following golf scene, which is pretty darn impressive.